Does Your Dog Have Bad Dreams? - Petpav - Your Online Magazine for All Things Pet! Does Your Dog Have Bad Dreams? If your dog is fast asleep and you see him or her twitching or slashing around, it could very well be that your dog is having a nightmare or bad dream. There have been many studies done to see if dogs actually do dream and it apparently seems that is the case. Of course, we can’t ask them so it is hard to know for certain. However, if your dog does dream, he or she could be having a nightmare or just a bad dream. Why do dogs have bad dreams? As mentioned above, no one can really know what goes on inside the mind of a dog. It is also not known why nightmares occur. In humans, nightmares can be associated with a traumatic experience. It is therefore possible for an abused dog to have nightmares. Or maybe your dog has just had a bad encounter that he only remembers when sleeping. If you notice your dog dreaming and possibly having a nightmare with twitching eyelids, paws flailing, yelping or whimpering, it’s probably best to let your dog continue to sleep–since deep rest is important–plus, waking him may cause confusion. However, if your dog does wake up on his or her own, soothe your dog’s fear by talking in a soft voice to wake him or her up. Do not touch him because you could be putting yourself in a dangerous situation. Dogs that are woken up mid-nightmare have been known to growl and bite. You can try giving your dog his favorite toy and put it next to him as he sleeps. This will give him a calm feeling when resting and could help him dream happily. It works for infant children, so it could only help our canine companions as well. Even a shirt with your scent on it can be helpful to soother your dog. If your dog is urinating or defecating after a particularly disturbing dream, you should go to see your bet immediately. 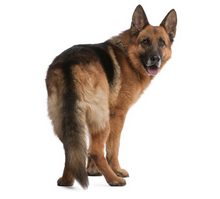 Dogs will typically lose control of their function to eliminate appropriately after a seizure. Night terrors and seizures can sometimes look very similar. If your dog’s sleeping behavior seems unusual and he or she has continual nightmares, keep a diary or account of when the dreams occur, what your dog ate and how long before going to sleep, and what noises, if any, were going on in the house. This information may be valuable to a vet (or pet behavior specialist) in determining the cause. It is also very helpful if you can take a video of your dog’s episode and show it to your vet. If he is, in fact, having frequent nightmares, your vet might consider a natural anti-anxiety supplement like Composure or Calm Shen.